The primary defense against stripe rust infections is through plant breeding. Different varieties of wheat and barley have been selected for their resistance to stripe rust. The reason breeders continue to select for resistant varieties is that over the years, pathogens can develop the ability to overcome the genetic resistance in specific varieties. New varieties are bred and released to cope with new mutations of stripe rust in what becomes an ongoing agronomic equivalent of an arms race. Consequently, the first step in dealing with a potential stripe rust outbreak is to know which varieties you have in the ground. Data on stripe rust resistant wheat and barley can be found using UCANR's small grain variety selection tool. Choose the appropriate selections from the drop down menus, locate the varieties you planted this year, and scroll over to the disease ratings (Figure 2). Varieties will be rated R- resistant, MR- moderately resistant, MS- moderately susceptible, or S- susceptible. To preserve efficacy of the resistance gene, plant wheat varieties with the number 515—these contain multiple resistance genes and are the only way to ensure control of all strains of the rust (see pathogen below). Foundation seed with stripe rust resistance is also available (eg. Patwin 515 HP, which is a hard white variety). 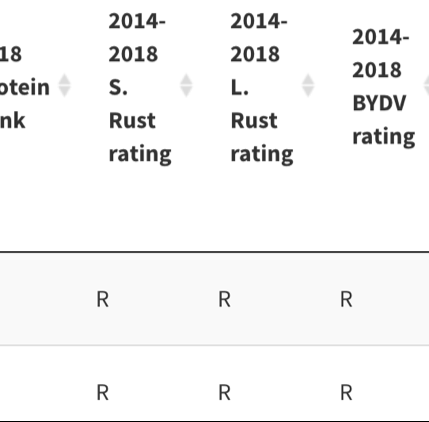 Granted, it's too late in the year to plant resistant varieties, but it's important to know where you had susceptible varieties this year as next year's volunteers may become sources of stripe rust inoculum. Furthermore, ensuring that any future-planted varieties are resistant will help reduce the risk of outbreaks down the road. The stripe rust pathogen, Puccinia striiformis, survives over the summer on volunteer wheat and barley plants and some wild grasses. Since this pathogen needs a living host, it does not survive on crop debris. In autumn, when temperatures go down, the recognizable orange spores are blown by wind into the planted wheat and barley fields. After infecting the plant, it takes only 7-10 days for the fungus to start making spores on the plant. 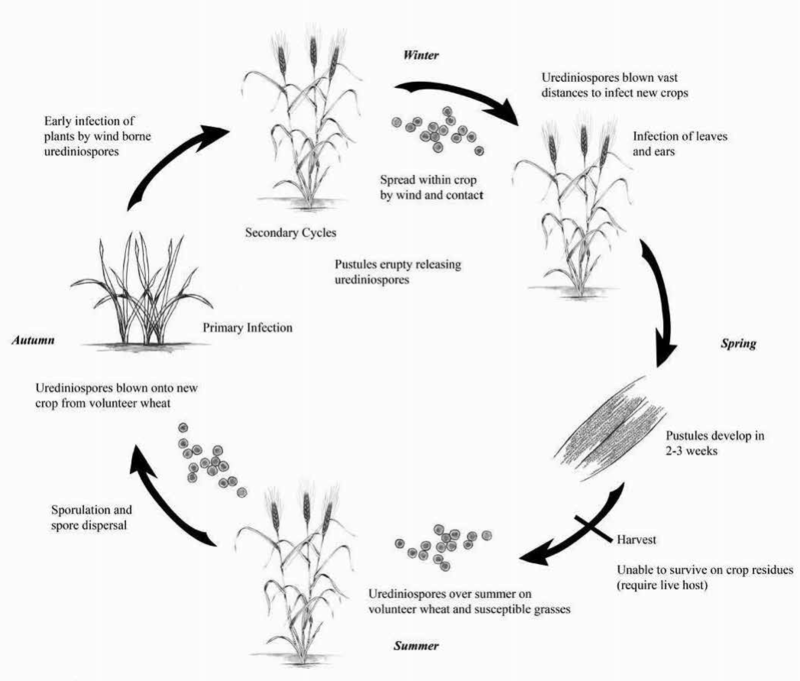 In favorable years, spores will start to form on wheat and barley in the fall and winter; infection of the heads occurs in the winter and spring. Spores spread within the crop and to new fields by wind and contact. Different strains of the fungus affect wheat and barley. There are 100 races (strains that can resist the pathogen) that occur in various geographical areas. In wheat, for example, there are two different races of the fungus present in California. Stripe rust can be managed by the use of varieties with resistance to all races that effect wheat: Yr5 and Yr15 resistance genes, hence the ‘515' in ‘Patwin 515' or ‘Yecoro Rojo 515'. Stripe rust is a cool season disease--optimal conditions for spore production and infection are between 50- and 60-degrees Fahrenheit, although the pathogen can reproduce effectively between 40- and 70-degrees Fahrenheit and can survive freezing temperatures. The disease is favored by high moisture. 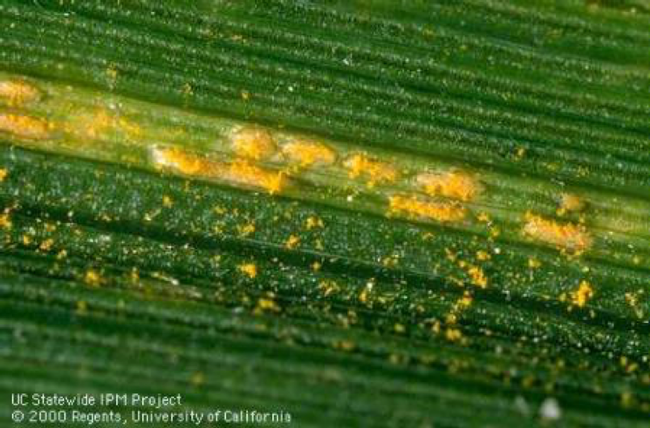 Stripe rust requires a minimum of 3 hours of dew at night to infect plant tissue. These conditions are most often met in the plant canopy where sunlight and evaporation are reduced, leading to relatively cooler temperatures and higher humidity. Persistence of the pathogen on volunteer wheat and barley plus some wild grasses in the summer is also influenced by temperature—since the pathogen is not very heat tolerant, hot summers can reduce total inoculum in the area by essentially baking it out of the area. Likewise, persistence is favored by moderate summers, resulting in higher starting pathogen loads in the fall. 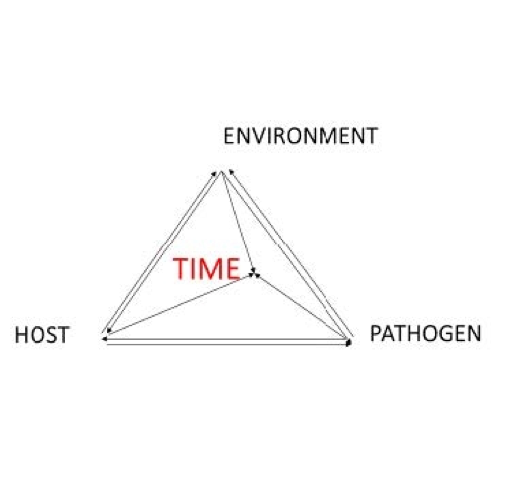 The disease triangle is sometimes expanded to include time, the idea being that even if the other three elements of the disease triangle are in place, the pathogen requires a certain amount of time to grow and reproduce. Time under the correct conditions thus determines the stage of a disease outbreak. Temperatures were mild this past summer, creating ideal opportunity for large summer populations. 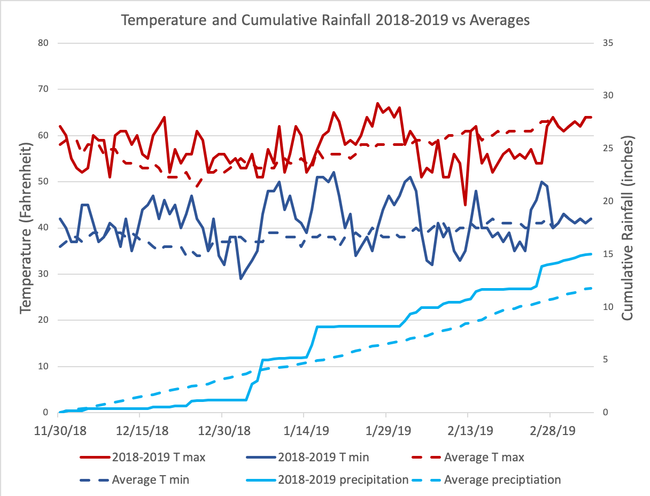 In addition, this winter has been very wet—we are currently above average for total rainfall for the year; temperatures have been moderate, often in the ideal range for stripe rust (Figure 3). These conditions are good for stripe rust and bad for wheat and barley. Although conditions have not been perfect (most days were only between 50- and 60- degrees for a few hours at a time), stripe rust spores have had ample time to develop since the first rounds of wheat emergence in late November. All growers, regardless of planting date should be on the lookout for stripe rust in their fields this year. Check in the lower canopy as those leaves have the greatest chance of having been infected. Fields that were planted with susceptible or moderately susceptible varieties should be the first priority, but growers should also spend some time checking the status of resistant varieties. In the event that new races of the fungus are detected, which render resistance ineffective, foliar fungicides can be used to control disease outbreaks; in cases where resistance is not available, this is typically not an economically beneficial approach to control (unless the crop is a high-premium specialty grain). The objective of fungicide protection is to protect the flag leaf from infection and protect during grain fill. Information on fungicides can be found on the UC IPM website. Be sure to check with your local Ag Commissioner regarding local restrictions and the proper use of different fungicides.